"I just don't have a green thumb! I kill everything I plant!" Or, so folks say. Having grown up in the Deep South with a heavy cinematic helping of Fried Green Tomatoes, every time I hear such woes, I can't help but think, "The secret's in the [soil]." I remember taking a trip to Indiana when I was a kid, 11 or 12 years old. By this point, I had already been gardening every spring for a few years. Due to my wonderment, we stopped on the side of the highway to inspect a field of Indiana corn. The stalks were a solid 10-12 feet high, maybe taller! Each stalk had 2 or 3 ears of corn. But the thing that really hit me was the soil itself. It was jet black! Having been trying to build soil in my childhood garden, I asked my mom, "What did they put in their soil?!" She explained, "That's just how it is in Indiana." But for those of us in the Deep South-- who don't live in the Bayous of Louisiana or in Belle Glade, FL, we don't have the luxury of inheriting eons' worth of jet-black soil. Before I go into how to build soil for better crops, which I'll explore in my next post, let's talk background: what is soil? And, what makes it great? Notice I didn't say dirt. Dirt is a 4-letter word for that dusty crap that piles up at the base of your driveway, the stuff smeared on your backdoor by your 3-year-old, the skeletons in your closet that someone has on you. Don't call your soil dirt. Okay, sometimes I say dirt, like when I fill a bed with my Magic Mix and say, "Look at that great dirt!" But the point is that soil is more than dirt. Dirt is just the "mineral" part of soil, which is- mostly - sand, silt, and clay. And, you should know that this sand, silt, and clay often contains nutrients like nitrogen, phosporous, potassium (aka "The Big Three" - which you'll see listed on bags of fertilizer) and, even things like sulfur, calcium, magnesium, iron, boron, and a host of other micronutrients. So, clearly, dirt is important but, by itself, won't grow very good crops. To explain, let's talk about what distinguishes soil from dirt. Good soil contains as much as 45% dirt but is also comprised of roughly 25% water, 25% air, and- here's the kicker- at least 5% organic matter. At least 5%. 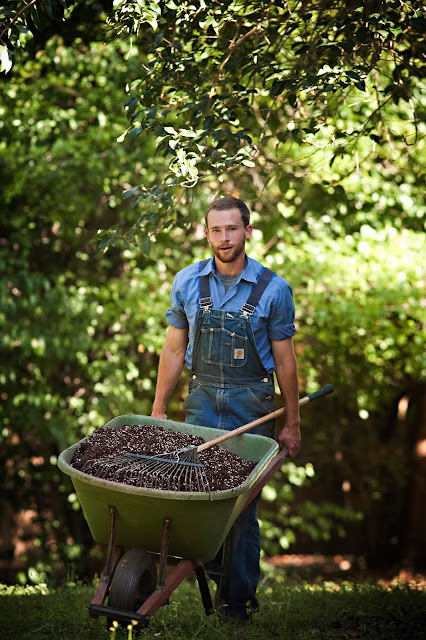 Sometimes good soil can be as much as 49.9% organic matter, with just a "smidgen" of dirt. But, however much there is, it's the organic matter that's key to great soil. Organic matter, is everything that is 1)alive, 2)recently dead, and 3)once alive but long-ago eaten up, pooped out and probably digested again, again, and again. (This last type of organic matter is called "humus," which is what makes soil dark, or, in high amounts, black). These three types (or stages) of organic matter are both the food and the lodging of beneficial microbes that continually breakdown nutrients, so that they are "available" to the plants you're trying to grow. You can consider good bacteria, fungi, protozoa, beneficial nematodes, and the rest of good soil's microbe community as the chefs of the soil. Most nutrients in the soil are much like whole potatoes. Just as you'll need to chop up and cook your potatoes before expecting dinner guests to eat them, your microbes have to breakdown the nutrients in the soil, so they're "available" to your plants. Another benefit of organic matter is that the worms (and other visible creatures) will move in because they've got something to eat. They'll open up channels in the soil for air & water to flow. They'll poop out sticky stuff that helps hold the soil together in clumps, so it doesn't collapse into a bunch of anaerobic mud when it rains. These channels and clumps allow it to quickly absorb water as well as drain, so it doesn't water log. This "soil structure" that helps water flow into and through good soil also helps air penetrate deep into the soil, which helps maintain the 25% air, 25% water balance - key to keeping the beneficial soil life alive and well. Another way of saying this is that good soil is both moist and aerated. Good soil is awesome! It's a whole ecosystem in and of itself. Everything you learned about ecosystems: primary producers, herbivores, predator-prey relations, nutrient cycling,... it's all happening right there in the top couple inches of any good soil, and it's key to plant health. In fact, according to one of the foremost soil biologists in the country, Elaine Ingham, plants are largely in control of the "soil food web" since they have the ability to secrete sugary substances (called exudates) through their roots. Plants' exudates are specifically tailored to benefit the growth of specific nutrient collecting bacteria and fungi, so, for instance, if a plant needs chromium, the plant will put out exudates that encourage the chromium-finding bacteria and fungi to reproduce and gather chromium. However, it's not until another, larger, soil microbe, further up the food chain, like a beneficial nematode or protozoa, eats the bacteria or fungi that the nutrients will be "mineralized" or made "available" to the plant. So, without a well-developed soil food web, your plants won't be able to get what they need no matter how nutrient rich your soil might be. This is what I meant when I said that dirt, by itself, won't grow good crops. In my next post, I'll talk about how to build great soil. For now, to close, my tip is: avoid chemical fertilizers, herbicides, and pesticides that disrupt and kill your soil ecosystem (Yes, this includes Miracle Gro). In the meantime, learn all you can about caring for and improving your soil food web. If I had to venture a guess, one day soon, we'll openly wonder at the fact that we once used chemical fertilizers, broad-spectrum pesticides and herbicides on our gardens and farms because working with natural systems is wildly more productive-- not to mention less poisonous. 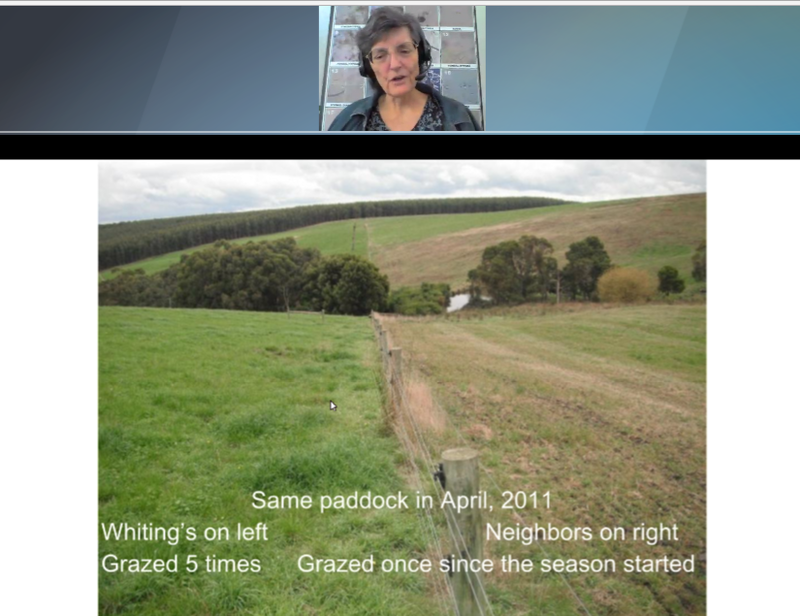 Just take a look at this picture from a recent webinar with Elaine Ingham, the agricultural soil biologist I mentioned above. The pictured fence line separates two farmers' dairy pastures. 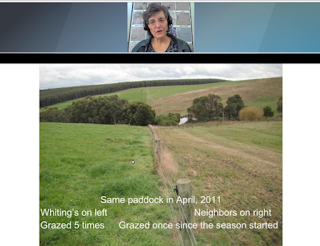 Until the year pictured, these two fields had been managed the same. This year, the field on the right was re-seeded (to fill in ruts & gaps in the grass) and fertilized with "conventional," chemical fertilizer (your standard "seed and feed"). This is the standard and recommended practice. On the left, per Ingham's suggestion, the field was not reseeded or chemically fertilized. Instead, it was inoculated with beneficial soil micro-biology by a few applications of compost teas. By late in the growing season, the grass on the left had grown so prolifically that the farmer had grazed cows through the field 5 times and, at the time of the photo, just weeks later, was 6-12" tall again. The farmer of grass on the right, which had been chemically fertilized was only able to graze cows on it once, and by season end, it was looking brown and patchy, in need, again, of re seeding and fertilization. 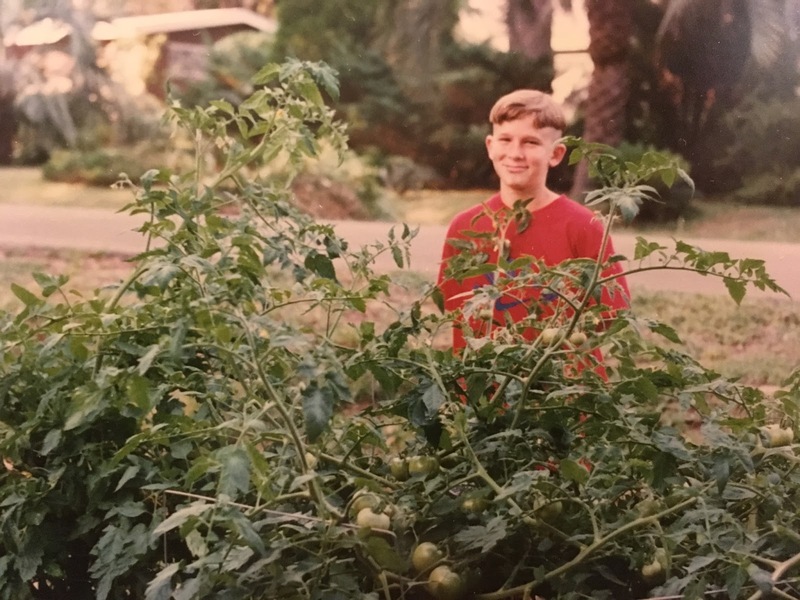 If you were farming or if you were in ag-business, if you were trying to buy milk for your children, or, if you were simply trying to #GrowYourGroceries in your own raised bed food garden, which of these two methods would you gravitate towards? Though I tell people to #GrowYourGroceries, the real secret is to focus on caring for your soil, because good soil (with a little sunlight), will grow your groceries for you. If you've got good soil, your food garden will produce more than you can imagine. Then, you'll hear people say things like, "How do you do it? I kill everything I touch. You must work in your garden all the time!" You'll just smile and think, "The secret's in the soil." If you would like to receive my "semi-monthly" updates, which include a story and food gardening tip please click here.